David’s note: is it a coincidence that ultra-successful Salesforce professionals somehow find time to give back? Or that they are always humble and thankful to their mentors?! I love your attitude and story Nirav and I’m proud to have been part of your journey! I am not sure if this piece qualifies as a Success Story but you and your amazing work, spread by SFDC99.com; are the reasons that have encouraged me to take up this opportunity to express myself through words here. My name is Nirav Shah and I am from India. I completed my post graduation in 2013. Unfortunately, my career started at a low ebb! I was unsuccessful at the campus interviews conducted in my college. After 3 Months of struggle, I got a job as a Cashier in a Private Educational Institution. But I kept looking for a job in IT, especially in Cloud Technology. During this time, I received an email from my current employer, Confident Governance, informing about an opening in Cloud Technology, SFDC. I immediately contacted them and I got my first job as Cloud Developer. It is from this point that my journey as a Salesforce Professional begins. At the time of joining, I didn’t know about the Salesforce Platform. I had not even heard about Salesforce Platform. After joining the Company I started learning regarding Salesforce, using different resources like Google, Salesforce Success Community and other Salesforce Materials. For the first few months after my joining, I didn’t get a chance to work on the actual platform. But, I kept learning about Salesforce from different resources. The best thing in this company was that I found a mentor in my colleague Mr. Sandip Patel. He turned out to be my role model – a prime reason for my 3 long years of career on Salesforce Platform. He guided me all the time during my career. He suggested to start learning with your blog (SFDC99.com), but due to some other work and duties assigned to me, I was not able to spare much time to learn salesforce. Meanwhile at the time of my first performance review I faced disappointment, with my manager saying “Nirav, I feel that I have made a wrong decision by giving you a chance” but he also said that “I know you can prove me wrong and I will be so much happy by being proved wrong”. I was totally depressed due to this incidence. I talked to Sandeep and Nirdesh (My colleagues) regarding this but they suggested not to give up and start reading success stories from SFDC99.com. So, I have started to read your blogs after the company’s working hours. I used to go to a cyber cafe and spent 2-3 hours a day to learn regarding Salesforce as I didn’t have Laptop or Desktop facility at home. I first read the success stories from your blogs which inspired me a lot and from that time, I made a goal that I also wanted to inspire others with my Story. Being in a small startup organization, I was called upon to carry out many different tasks other than Salesforce or even Coding but I always kept in my mind that I have to keep focusing on Salesforce all the time, notwithstanding the other tasks assigned to me. After some time we got a SAP Project and my manager asked me if I would like to work on this project or not? I thought this was the time I can prove myself and agreed to work in SAP Project. I worked on the Project for almost 1 long year, but I didn’t give up on the career I have chosen. I kept learning Salesforce through your blog. I also used to follow Jeff Douglas’s blog. After completing the SAP Project, I got a chance to get my hands dirty in the Salesforce Platform. I have worked on various aspects of Salesforce like Process Builder, Workflow, Security Settings and much more. Now this was the time to prove myself. From your blog I used to know regarding the Certification in Salesforce and I started the preparation for ADM 201. I got my first Certification (ADM 201) on Jan 22, 2016. During this time I also get promoted as a Team Lead. That was such a proud moment for me to become a Team lead from a Non-Salesforce background. After that I added another certification – App Builder to my credentials. 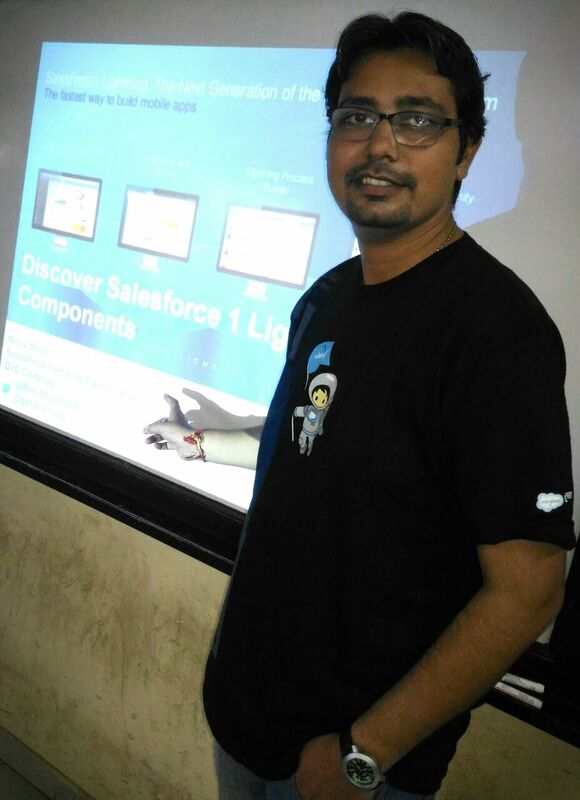 During my journey till date, I have been interacting with my customers as a main point of contact, demonstrating the product to prospects, guiding students who join us for dissertation, spreading awareness about Salesforce and Cloud Technology, delivering Lectures at Educational Institutions. Currently, I have two Certifications from Salesforce and I am a Technical Team Lead leading a 15 Plus Team and spreading my knowledge of Salesforce among them and I had made a goal to become a 5x Salesforce Certified in 2017. At the end of my story, I would like to thank some special individuals who are directly or indirectly attached with my journey. My God – I believe, He lives inside me, listens to me every time and He loves me a lot. My father – He trusted me on every phase of my life whether it is about choosing the career option or allowing me to skip joining our family business. David Liu – As a living inspiration, you have truly encouraged a lot of people like me to learn SFDC and coding. David, you are the ROCKSTAR of Salesforce!! Sandip Patel – My colleague/role model who is known for his personality. I would not have made a career in Salesforce without him. Rajesh Pillai – My First interview Taker, Who trusted me and offered an opportunity to join a company as a fresher. Bhavesh Bhagat – CEO of my current company, who trusted me and believed that I can do the things and I can achieve all the things I want. Finally, Thanks for posting inspirational stories and motivating your readers to take up challenges and solve them. Great!! Who knows, maybe one day your story will be here too! Congratulations Nirav and very success journey. Congrats Nirav. Very inspiring story. I think every freshers must read this and start working hard with open mind and accept the challenge as “Chance to prove”. All the best, wishing you bright future ahead. Team Lead in less than 3 years, from scratch, thats really fantastic!! Congrats. It’s a very inspirational and yes life is hard and we have to look little harder in some days but we should have faith that things will get better.There is “N Team – Nothing is impossible”. It’s really a very good opportunity for me that I have started my career with the person like you. You always inspired me. Thank you for sharing. I’m so happy you were able to push yourself and it makes me feel like I can too! It sounds like you’ve got a great support system! You are one of the good Team leader and mentor for me during my Salesforce Career. Have a Great Journey in Salesforce. Thanks for inspiring me/us and many congratulations to you. David – Thank you so much for inspiring people like us. Please keep spreading your knowledge and great work as always !! Welcome to Salesforce Family Nirav. You are right David has inspired so many of them. Good luck for you in Salesforce Career. This is Hemant Mahale, i am very happy for your sfdc success journey.